Crystal Davis looks at urbanization and its impact on environment and development in Part I of a three-part series. Check out other analysis by Crystal at https://earthtrends.wri.org. Now home to half of the world’s people, cities are increasingly at the forefront of our most pressing environmental challenges. While the current pace of urbanization is not unique in human history, the sheer magnitude of urban growth–driven by massive demographic shifts in the developing world–is unprecedented, with vast implications for human well-being and the environment. However, where cities pose environmental problems, they also offer solutions. As hotspots of consumption, production, and waste generation, cities possess unparalleled potential to increase the energy efficiency and sustainability of society as a whole. Cities generate a disproportionate share of gross domestic product (GDP) and provide, on average, greater social and economic benefits to their inhabitants than do rural areas. 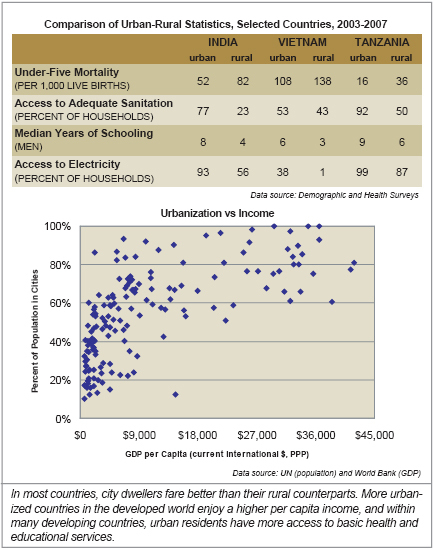 As a result, increased urbanization often correlates to higher national incomes (see Figure 1 above). Among industrialized nations, city dwellers already account for nearly three-quarters of the population and will grow in number by less than half a percent per year through 2030, while the rural population will actually decline (UN, 2008). Cities of the developing world, on the other hand, will absorb roughly 95 percent of the total population growth expected worldwide in the next two decades, a result of rural to urban migration, the transformation of rural settlements into urban places, and natural population increases (see Figure 2). All together, over 1.5 billion residents will be added to developing country cities by 2030, many of whom will be poor. Already, one of every three city dwellers lives in slum conditions (UN-Habitat, 2006). At the global level, these demographic shifts define a remarkable urban transition. By 2030, five billion people (60 percent of the global population) will live in cities and four-fifths of these urban dwellers will be in the developing world. Megacities–those with more than ten million inhabitants–will continue to grow in size and number, albeit slowly, especially in developing countries. The most rapid growth will occur in cities with fewer than half a million residents, which collectively account for over half of the world’s urban dwellers.